The solution in this article is for mic and home button problem.so if your mic and button not working you can solve your problem by using diagram in this post. If you have mic problem in Samsung I8910 Omnia change the mic first, a lot of problems completed by simply replacing the mic with a new mic, if this does not work,check mising line shown in below diagram. At this time tips I will discuss the problems of navigation Samsung i8910 Omnia, damage or trackpad navigation blakberry very annoying users, because without home button will not be able to use the handset. The first thing we have to do to make improvements on the trackpad Samsung GT-i8910 Omnia was the first to try to replace the connecter strip good, if by replacing trackpad does not work, you can try both ways. The second step you can check the trackpad connector is in good condition or damaged due to corrosion, if the connector is in good condition, you can try the third step. The third step you can check the trackpad lines as shown above, check one by one carefully each of these lines, if there is a path-breaking, try to do the jumper. Hope it helps. 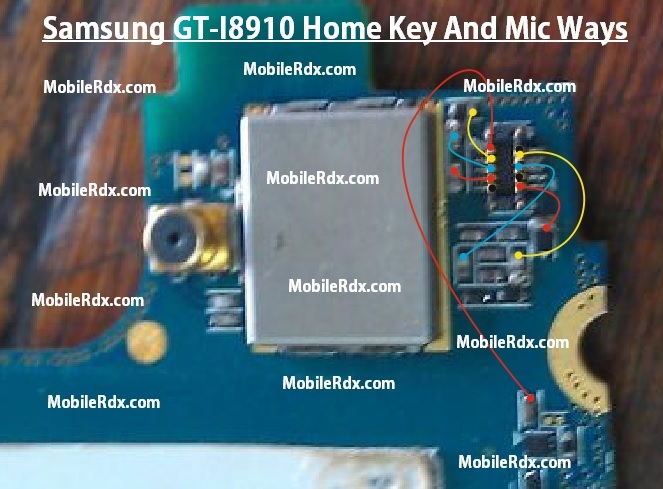 Samsung GT-I8910 Home Button Not Working,Ways,Home Key Jumper SolutionHome Button Ways.